THERE WAS AN OLD LADY WHO SWALLOWED A FROG. I DON'T KNOW WHY SHE SWALLOWED A FROG. There's hardly an event on the calendar that doesn't inspire this infamous Little Old Lady to go for a gastronomical glut, so why should spring be any different? Instead of reveling in the sounds of the first spring peepers, she eats one. As ever, however, the first course doesn't sit too well on her stomach. THERE WAS AN OLD LADY WHO SWALLOWED SOME DIRT. Does that put her off her feed? No indeed. She swallows some seeds. If you haven't figured out where this one is going, here are a few more hints. Down the the hatch goes some rain, some sunlight, some gardening gloves, and finally ... a rake. "BURP!" THAT WAS A MISTAKE. 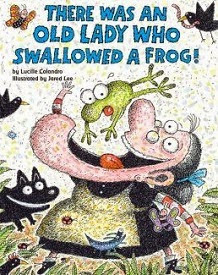 But everything coming up roses for a lovely spring garden, in Lucille Colandro's latest There Was Old Lady saga, There Was an Old Lady Who Swallowed a Frog! (Scholastic Press, 2015). Colandro's bouncy meter, unexpected rhymes, and sweet silliness, stirred up with just enough of the YUCK factor to keep youngsters gagging and giggling, work their magic with the help of trusty illustrator, Jared Lee, whose goofy artwork fits the bill for another of Colandro's tall tale romps through the calendar. Time this one just right and you can cash in your coupon for the two-for-one special with Colandro's companion Easter entree', There Was an Old Lady Who Swallowed a Chick!